Getting ‘in rapport’ with callers in the contact centre is a key skill for agents. This is particularly true if they need to sell or create customer loyalty. Carolyn Blunt provides three simple tips.It can also be useful in generating an overall positive impression about the organisation. It makes sense that if your callers leave with a lingering smile then they are much more likely to recommend your organisation. So how do you generate rapport with someone you’ve never seen, perhaps have not encountered before and with whom you have no idea if you share any common ground? Within the first ten seconds of a call it can be quite apparent what mood the caller is in. The agile agent will pick up this mood and will work with it – not against it. That means not being chirpy with someone who is angry, or sounding bored when the customer is in a happy mood. By ‘matching’ the positive mood of the customer or caller the agent can help to create rapport. When a caller is in a negative state then pure listening followed by empathy helps to soothe them before the agent can attempt to ‘lift’ them to a more positive place with some good questions or anecdotal comments or genuine feel-good praise. 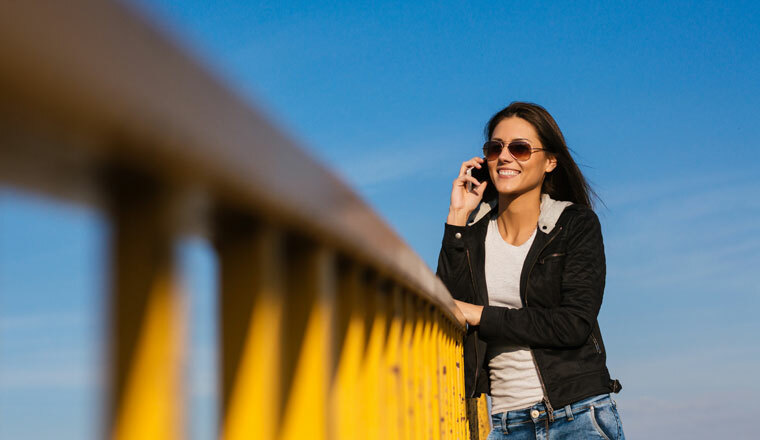 For example, as well as ensuring that solutions to any issues are tackled, a good agent will also build on any information offered: ‘Whereabouts in Spain are you going?’ – this gets the caller talking more positively and visualising the longed-for break. Alternatively, if they are ordering items: ‘Great choice, that is a really stylish top’ makes them feel good about the decision they made. When done with genuine interest and enthusiasm this approach can change a negative mood or reinforce a positive one. A really simple tip but extremely effective. The ‘cocktail party effect’ is the term used when you hear your own name used in conversation across a crowded room. You may not have heard what came before or after but you can pick your name out a mile away over a hubbub of noise. This is how powerfully tuned in we all are to hearing our own name. It is a powerful way to get attention and to build rapport. British people do not like to feel like their name is being overused in a cheesy, over-friendly way. Usually three times in a call is plenty, once at the beginning, once in the middle and once at the end. You will know yourself when it feels natural and appropriate to use someone’s name, so follow your instincts. Another rule is to make sure you get the name right! So often I get ‘Caroline’ instead of ‘Carolyn’. It is only a subtle difference, and while ‘Caroline’ is a lovely name, it is not my name. Getting my name wrong actually breaks rapport with me, it makes me feel that you don’t know me very well and/or you don’t listen and don’t care. On the phone there is no excuse for getting someone’s name wrong as you can write it down as soon as you hear it and you can write it phonetically – how it sounds to you! This is an easy way to make foreign or unusual names usable without resorting to the tired and lame ‘Sir’ or even worse, ‘Madam’. If you want to create rapport and make your customers feel valued, special and loyal then using their name is vital! Pay attention to how they introduce themselves. If I say ‘Mrs Blunt’ then call me that. If I say ‘Carolyn Blunt’ then it is probably okay to use my first name but you can always check: ‘Is it ok to call you Carolyn?’ Most people won’t mind if you check formality or pronunciation. It is the incorrect assumptions that irk the most and lose rapport. In my career as a contact centre trainer and coach I have listened to thousands of live and recorded calls and still nothing makes me cringe quite so much as what I call the ‘tumbleweed moment’. This is when the caller/customer makes a joke or a little comment and the agent ignores it. There is usually an awkward, brief silence before the agent moves on. Listening to that I can almost feel that cold wind and see the tumbleweed rolling by as a sinister bell chimes in the background. Horrible. 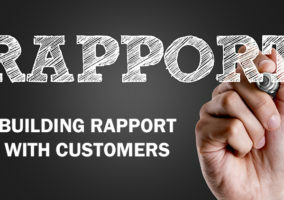 If the customer offers the branch of rapport then the agent must take it! It is their job to do so! I can understand that some agents don’t want to get sidetracked for an hour talking about unrelated topics (staying on track with call time is a whole other topic! ); or that some feel bored or disinterested; but equally a few seconds spent in building and maintaining rapport help to keep the call flowing nicely and give both the caller and agent a more positive experience. Getting the balance and avoiding either extreme is a key skill of a good agent. The easiest way to do this is to acknowledge what was said with a stock phrase, something that shows you are similar: ‘Oh I know, that happens to me all the time!’ or ‘Oh I do that too!’ (or if you don’t, then mention that your partner, mum, dad or someone else does) and then a little chuckle before, ‘So, Mrs Smith, you mentioned before that your policy expires on 25th…’ It is easier to keep a call on track if you only spend a brief time off topic. The challenge happens when you have been indulging the caller for ten minutes and then think about bringing it back. This can be a bit too late and can sound awkward and feel embarrassing. ‘Little and often’ work best when it comes to making an effort with rapport rather than one, lengthy attempt. Building and maintaining rapport on the telephone happens when agents listen, show energy and are self-aware. Some agents seem to be naturally gifted with this ‘knack’ whilst others have to work at it. It is a skill that can be trained, learned and practised. Product/service and system knowledge also assist with rapport as this ‘safety blanket’ of knowledge helps the agent to ‘relax’ into the call enough to focus on rapport. Opportunities to play back calls and coach on rapport will assist agents to feel confident to avoid those tumbleweed moments. This is a great article with beneficial rapport building tips. I especially enjoyed your ‘tumbleweed moment’ section. I have never heard it positioned that way, but you are so right about it being an awkward moment for both the customer and the agent. I also enjoyed the way you positioned the ‘branch of rapport’. This article is very clever and smartly written. Carolyn is spot on when it comes to getting the ‘rapport’ right with callers. This is why the tone of voice workshops we run using actors are so popular. Contact centre staff can underestimate the power of their voice.. yet on the phone it is the most powerful tool they have. Excellent article. Very informative topic.. Good read and will benefit our team. We struggle with Rapport as Agents like to resolve the query and close the call. These tips will definately address this issue. I work on a Switchboard for the International Publishers of Yellow Pages and I found this article very interesting, helpful and informative. Great Article – and it sums up the “building Rapport” component of a call nicely. I will be sharing some of these tips in our employee newsletter. hey, thank you so much for this article, helps a lot! HI Carolyn – agreed a really useful publication, thank you for sharing. One question, more and more agents are asking “how are you today” or addressing inviduals as “mate”, “madam”… what is your training strategy in relation to such over familiar phrases..
Hi Emma -good question, my rule of thumb has always been to avoid terms of endearment (mate, love etc)and also madam/sir and use the customers name instead. This is much more personal and builds rapport. Just check they are addressing the customer correctly (how they prefer to be addressed) and are not overly familiar. Go more formal if in doubt. Asking ‘How are you today?’ is ok if done in a genuine way but if the only answer you want to hear (for sake of AHT) is ‘Fine thank you’ then I wonder whether there are a better questions you can identify based on their transaction history. This has been so helpful to me.All the things has been said were indeed true. Thank you and God bless. Keep it up.